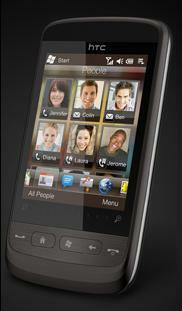 HTC Touch2 is ready to help you with all the things you want to do on your phone. Stay in touch with your friends, find out what they're up to on Facebook, check your mail, or browse the web. It's all at your fingertips in a compact phone that fits nicely in your hand. Ready to do even more with HTC Touch2? You can add games and applications from the Windows Marketplace to personalize your experience. And you can keep your stuff safe when you back up to Microsoft's My Phone servers without a PC. Call your colleagues or friends by finding a familiar face. Browse through incoming text and multimedia messages with just a flick. Pick out your day's attire by checking the weather tab. Read up on the hottest news from the browser. Check the calendar and get ready to be a star at your next meeting. All this and more delivered to you on the super intuitive interface that puts the most important content within your fingertip's reach. With the introduction of Windows Mobile 6.5 comes the long awaited Windows ® Marketplace for Mobile. What it means to you is that you now have a secure place to come and browse applications and games optimized for use on your phone. So the phone you buy today grows with you as you get more of the applications you need to help you get the most out of life.